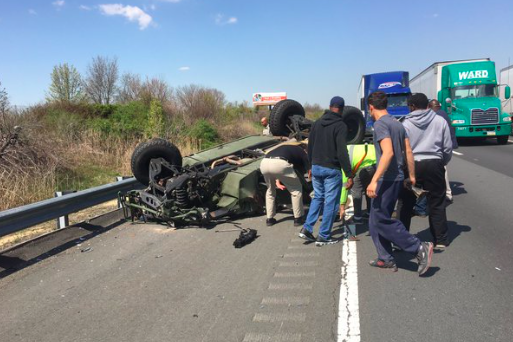 Military Humvee overturns on New Jersey Turnpike on April 14, 2016. Two Army Reserve soldiers are in critical condition and two others were injured Thursday when a military vehicle overturned on the New Jersey Turnpike. According to the New Jersey State Police, the incident occurred Thursday afternoon at milepost 74.9 on in South Brunswick. The two seriously injured soldier remain in critical condition on Friday, the South Brunswick, NJ Patch said. The Humvee overturned while it and another military vehicle were heading south on the Turnpike. A female soldier was described as appearing to have an amputated leg and the three other soldiers were trapped under the vehicle. No one in the second Humvee was injured and the personnel in the vehicle assisted the other soldiers. Two soldiers were taken away from the scene on stretchers and appeared to be alert. A third male soldier was also able to walk away from the accident. The victims are being treated at Robert Wood Johnson University Hospital in New Brunswick. According to 6 ABC, the accident appears to have been caused by a faulty tire, which was found about 40 feet from the Humvee. All of the soldiers involved were reportedly from the 533rd brigade Support Battalion at Fort Totten in Bayside, Queens. Southbound lanes of the Turnpike were shut down for most of the afternoon but have since reopened. Drivers are experiencing major traffic delays.